Deciding to divorce is a difficult decision to make. A California divorce can be as simple as two people splitting up their furniture and deciding who will pay which bills. It can also be a highly contested battle between parents over the children. No matter what type of divorce you are going through, I can help you understand what you need to do in order to protect the best interests of you and your family. I will work with you to help eliminate drama and distress while being a strong advocate for your best legal interests. To find out how I can help you, please schedule a free phone consultation so we can discuss your needs. 1. Division of property: Real property (like your home) and personal property (everything that isn’t real estate) that was acquired during the marriage. 2. Determination of Spousal Support: If there should be spousal support, who should receive it, how much the spousal support should be and how long should it last. a. Custody: Who will have physical and legal custody? b. Visitation/Timeshare: The parent who does not have primary custody will have parenting time (also called “visitation” or “timeshare”). c. Child Support: Both parents have a legal duty to financially support their child. Child support is based on a number of factors but the main factors are (1) amount of time spent with the child and (2) the income of the parents. 1. Summary Dissolution: A summary divorce is the simplest and you will not have to appear in court. To qualify you must agree to the divorce and how the debts and any assets are to be divided between you, have been married for less than 5 years, have no children together, you don’t own much, you don’t owe much, and neither of you want spousal support from the other. You can do this without a lawyer, but it is often useful to have an appointment with a lawyer. Make sure you are not giving up your rights to something unknowingly during your California divorce process. a. Uncontested: To qualify you must agree to the divorce, and agree to all issues that apply to your divorce. b. Amicable or Collaborative: To qualify you and your spouse must agree that you will not file paperwork with the court before reaching full agreement on all issues. You often work either with a mediator or with your own attorneys to reach settlement. When a settlement is reached on all issues, then the proper paperwork is filed with the court as an uncontested dissolution. c. Contested: This is the “normal” in California divorce. Most “normal” California divorces are a combination of the spouses agreeing on a few things, but then fighting over other areas. When you or your spouse cannot agree on an issue, the law requires that a judge decide and make the court order. The California divorce court system can be very time consuming and expensive to complete a divorce when the divorcing parties do not agree. The national average for a contested divorce is $50,000, but they can cost even more when there are high conflict issues regarding children or property. 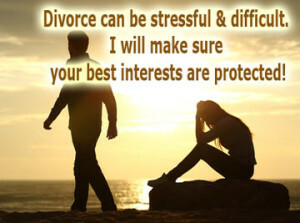 I have experience helping couples with the many issues involved in divorce. My goal is to help you keep the tension down, increase cooperation, and seek a peaceful solution with minimal cost so you can look forward to the future with money in your pocket. Please schedule a free phone consultation so we can discuss your needs. At this time, I do not work with couples who have abuse or domestic violence issues.